Hold up though, this doesn't at all! would one print this bigger, or sit it on a raised embankment. Also, that's my first try at a print, could have gone worse, could have been a much better colour of PLA! is people forget to factor the roadbed into the height required. but is my general scaling of the object right? 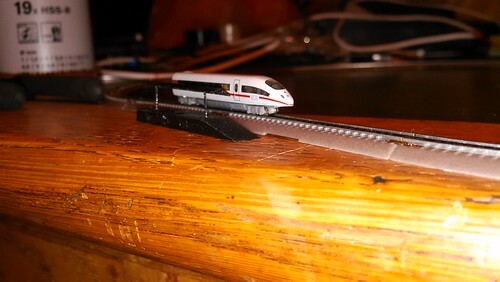 should i just extend it downwards by the height of the track, or would i scale it up by say 20% overall. I'm not really sure what the best approach is. Mike's taken the words out of my mouth. I was just about to post the same comment. 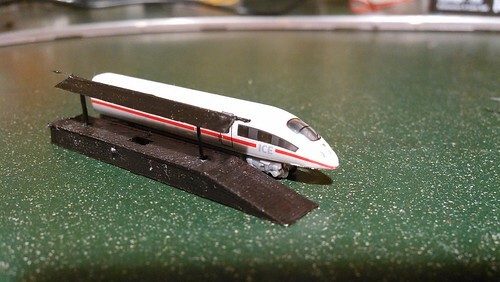 And to answer your question, take a look at the platform sections in the Talking T Gauge Shop.....and you'll see I've put the platform structure on its own little platform to compensate for the built-in track bed. On the platforms I've done for my Bridge layout, I still needed to build the platform up....but by the height of a sleeper. I'm using flexitrack. The thing that I have done in the past is to try and get the ground level that platforms etc are being built on the same as the lower height of the sleepers, especially in other scales because it gives you more scope, also by building up the ground you can then use the slope on the track bed sides to simulate drainage channels by the track.